Simon Says Create with Critters! This week the challenge is Create with Critters! I love the cuteness of Lawn Fawn stamp sets. And I really adore the cute otter in the Otterly Great Birthday stamp set and dies. 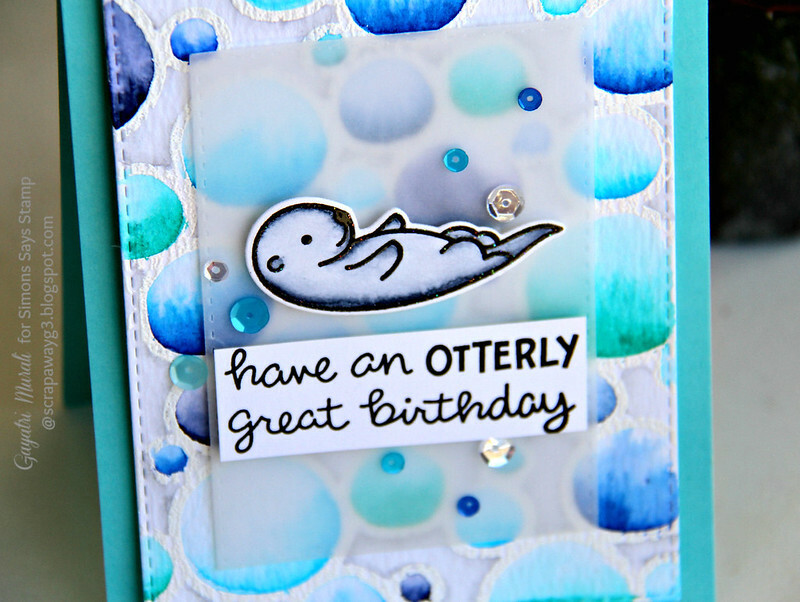 This is my card using the adorable otter image from Lawn Fawn! I black embossed the otter and watercoloured using Zig Clean Brush watercolour pen. Then I die cut the otter using the coordinating die. Then stamped the sentiment on a strip of white cardstock and trimmed the edges. For the background, I stamped the new Stepping Stone background stamp from You have my Heart collection from Simon Says Stamp in versamark and white heat embossed the image on watercolour paper. Then I coloured the inside of the stones in various shades of blue and aqua using Zig Clean Brush Watercolour pens. The background I shaded in grey. Once dry, I used the largest Stitched rectangle die from Simon Says Stamp Stitched Rectangle die set to die cut the watercoloured background. I adhered this panel to Audrey Blue card base using craft foam. Then added a layer of vellum which I die cut using the third largest stitched rectangle die. On top of the vellum panel, I adhered the die cut otter and the sentiment using foam adhesives. To bring the card together, I used Pretty Pink Posh’s Cobalt, Sea Breeze and Sparkly Clear sequins. The shades of blue watercolour on Stepping Stone background give the look of water on the background. Love that stamp set. Just change the colour and you have brand new background every time. Must have background stamp set. Hope you like my critter card! Love these happy blue bubbles surrounding your adorable otter, Gayatri! What a great use of the Stepping Stones stamp! LOVE your Adorable otter card!!!! I LOVE Lawn Fawn stamps!!!! 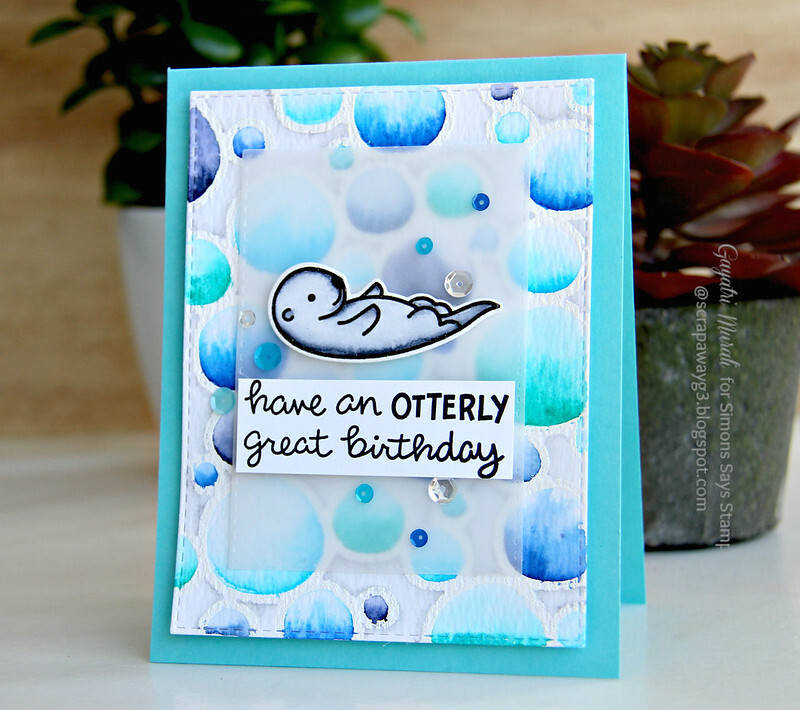 A gorgeous card Gayatri, a beautiful background with a super colouring……..your Otter is adorable on the vellum and sweet sentiment!! Lovely, Gayatri! The background is gorgeous!!! Otterly adorable, Gayatri…I have ordered this otter die and stamp (my DD is loving Otter!). Thanks for the inspiration! This is the cutest Gayatri. I just love your beautiful water color background. I absolutely adore this card!! Darling!! Adorable card Gayatri! Love that background!! Great coloring! Love your cute card and especially love the background you've made. hello Gayatri! sweet card, luv the background!